You must be a member of the Singapore Curry Group to attend this activity. Would you like to join this group? In celebration of the Singapore Bicentennial, we start off our curry exploration journey this year with uniquely traditional Singaporean curries, by indulging our palates to some phenomenal Peranakan curries. We gather at 7pm and start off the evening by each of us giving a brief introduction about ourselves and our love for curries. Then as we indulge our palates in the sensations of the different phenomenal dishes from Peranakan Cuisine, we would invite the manager of the restaurant to tell us more about the Peranakan culture and the rich cuisine. Since a lot of famous dignitaries of various nations have dined here you may even get to know if the curry you ordeted was one of their favourites too. We end of our culinary journey with a short trivia quiz. Cost per person: Pay as you go. To the ones who will be trying this cuisine for the first time.... Peranakan or Nyonya cuisine comes from the Peranakans, who are descendants of early Chinese migrants (who settled in Penang, Malacca, Singapore and Indonesia), inter-marrying with local Malays. 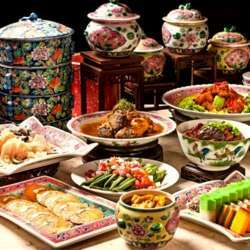 The culture and their cuisine combines influences from Chinese, Malay and other cultures. The old Malay word Nonya is a term of respect and affection for women, while Baba refers to the males.